The Amazon Pink Dolphin’s Voice: President Chávez & human rights for Amazon Nationalities-Venezuela says ‘no evidence’ of Amazon massacre! “No evidence of any death was found,” Minister for Indigenous Peoples Nicia Maldonado announced on state television. Maldonado said that a team of government investigators did not find evidence of the burnt communal hut described by the witnesses who brought the alleged killings to light. Brazil is pushing Venezuela to probe the alleged killing of nearly 80 indigenous Yanomani in the country’s remote southern Amazon region. Illegal Brazilian gold miners reportedly crossed the border by helicopter and massacred the tribespeople. In testimony presented to Venezuelan authorities last Monday, Yanomani leaders claimed that illegal Brazilian miners – known as ‘garimpeiros’ – opened fire from a helicopter and threw explosives at a large hut where around 80 people were living. Tribespeople who visited the site of the alleged attack said that they found the charred bodies of the dead and the burnt remains of the hut. “The three survivors of the attack said that the Irotatheri community of approximately 80 people came under attack. 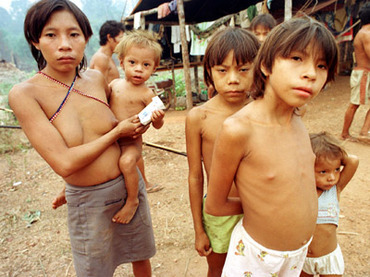 This figure has not been confirmed,” Luis Shatiwe, Executive Secretary of the Yanomami Horonami Foundation said. The tribespeople said the attack occurred after the garimpeiros tried to sexually assault some of the Yanomami women, Shatiwe said. “When the Yanomami tried to resist, the miners began to talk amongst themselves and mobilize to attack and destroy the community,” Shatiwe said, citing eyewitness accounts. The alleged massacre was perpetrated in early July, but was only brought to light by indigenous rights groups at the beginning of this week. Prior to now, the isolation of the border region prevented members of the Yanomami tribe from alerting authorities. These are not the first reports of violence perpetrated against the indigenous populations living in the far-flung regions of the Venezuelan Amazon. Reports of cross-border violence date back to the 1980s. In 1993, an incursion by Brazilian garimpeiros into Venezuelan territory left 16 Yanomami Indians dead in the Amazon community of Haximu. In response to the 1993 attacks, Venezuela and Brazil launched an initiative to ensure the safety of the vulnerable border communities. Much of the violence that occurs in the mineral-rich area goes unreported, and investigations are often not feasible because the region is so difficult to access. ~ by FSVSF Admin on 3 September, 2012.